Notice,The Power Transformer is Non-submersible !Glass Tube body, Not Plastic! 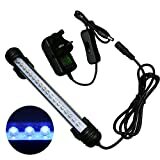 This entry was posted in Aquatics and tagged Aquarium, Blue, Color, Crystal, Fish, Freshwater18, Glass, LEDS8InchLighting, Light, Lights, Mingdak®, Saltwater, SUBMERSIBLE, Suitable, TankUnderwater by One Boutique. Bookmark the permalink.